Daniel Dresbach founded the community of Circleville along the Scioto River in 1810. The town received its name from circular earthworks that the Hopewell culture of pre-contact American Indians had constructed in the area, although urban development has destroyed many of those original mounds. Circleville became the county seat for Pickaway County in 1810, and the first courthouse was built in the middle of the circular earthworks for which the community was named. 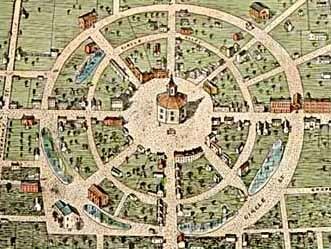 Dresbach laid out Circleville in a circular pattern. During the 1830s, residents tired of the unusual street patterns. In 1837, the Ohio legislature authorized the Circleville Squaring Company to redesign the community with a more traditional grid pattern. The Circleville Squaring Company completed work in 1856. This marked one of the earlier examples of urban redevelopment in the United States. Most of the American Indian earthworks disappeared as a result of this redevelopment. During the nineteenth century, Circleville became a prosperous town, in part because of its location near the Scioto River and its proximity to the Ohio and Erie Canal. It also became connected to the growing railroad network in the mid-nineteenth century. These transportation routes provided ample encouragement for the growth of manufacturing in the community. Most of those industries in some way related to local agriculture, including meatpacking, canning, tanning, and milling. At one point Circleville was recognized as producing the largest amount of broomcorn in the United States. In addition to its industrial and agricultural interests, Circleville was also known for its religious diversity. From its early years, a number of religious denominations had established churches in the community, including the Lutherans, Methodists, and Episcopalians. There were also a group of free African American families in Circleville who established their own Methodist Church in 1834. Numerous famous Americans lived in Circleville at various points in their lives. One of Circleville's early residents was Caleb Atwater, who wrote about the Native American earthworks in Ohio, including those at the original site of Circleville. He published one of the few descriptions of the Circleville mounds in his "Western Antiquities." Atwater served as Circleville's first postmaster. He also was a champion of public education in the state of Ohio. Benjamin Hanby, composer of "My Darling Nellie Gray" and "Up on the Housetops," grew up in the community, as did jazz musician Ted Lewis. In 1998, more than twelve thousand people resided in Circleville. Many of these people worked in new businesses that had replaced the tanneries and mills of the nineteenth century. Among these new industries was television manufacturer RCA. Agriculture remains important to Pickaway County and Circleville's economic well-being, although it has slowly declined since the nineteenth century. In 1982, almost ninety percent of Pickaway County's land consisted of farmland. By 1992, that percentage had dropped to just over eighty percent. Much of the land has become subdivisions, as more and more residents of Columbus, located approximately thirty miles to the north, prefer to live in a smaller community. Circleville is becoming a satellite community for Ohio's capital city. Circleville also has become world famous for its annual pumpkin show. Begun in 1903, the festival attracts more than 300,000 people a year. It is currently the sixth largest festival held in the United States, and since organizers charge no admission fee, the festival has become known as the "Greatest Free Show on Earth." The Circleville Pumpkin Show provides a showcase for Ohio's farmers and their products. Cress, Virgil M. The History of Circleville Schools, 1810-1976. Circleville, OH: The Pickaway County Historical Society, 1979.